Lizard Belly was my biggest lemming back in the day. When I finally did get it, my appliances had died at the same time and my joy was muted. I decided I needed to pay more love to the Lizard Belly. 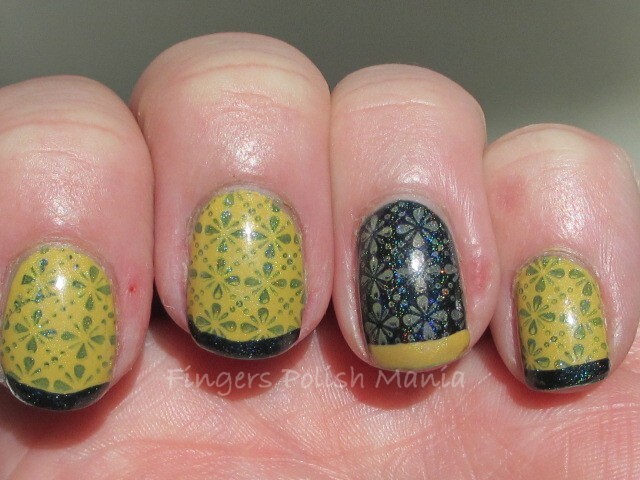 Also, just like the handmade brown holo I showed you, Elevation Polish made me a yellow holo! I have been wanting one since I saw her brown holo. I thought her yellow holo would pair nicely with Lizard Belly. Before we get there, let's have a discussion. You know I just did a huge blog sale. I sold a lot of polish. I actually sold them to earn the money to buy more polish. So the question is-if you were to quit blogging today, what would you do with all those bottles of polish that you have hoarded? Why do we find it necessary to own 10 different blues from 10 different brands? 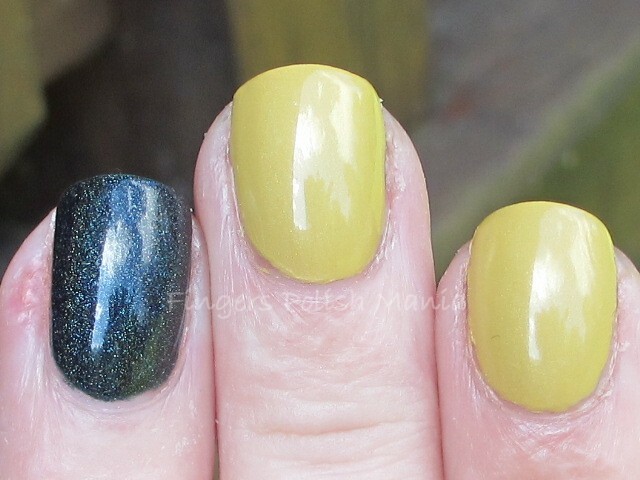 Is there some unspoken rule that mandates that you don't repeat a polish on your blog? If that is the case-how will you ever finish a bottle of polish? I just thought those were some questions I was wondering what your answers would be. Also, I am repeating a polish today. So if that breaks the rules, I'm ok with that! 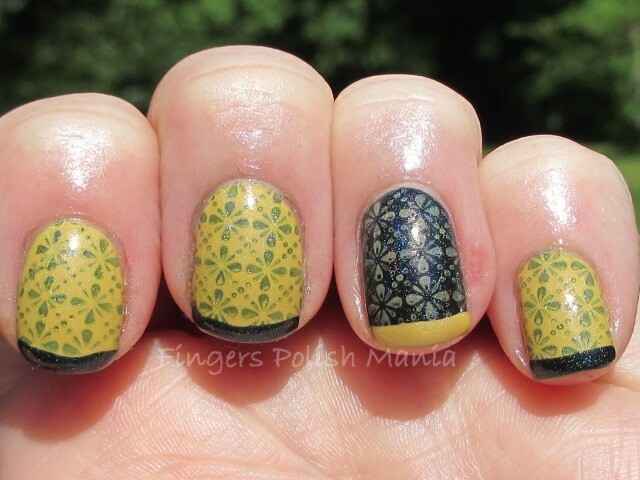 This is my special Elevation Polish Yellow Holo and Glitter Gal Lizard Belly. I started with the Yellow with an accent of Lizard. Here are those shots. 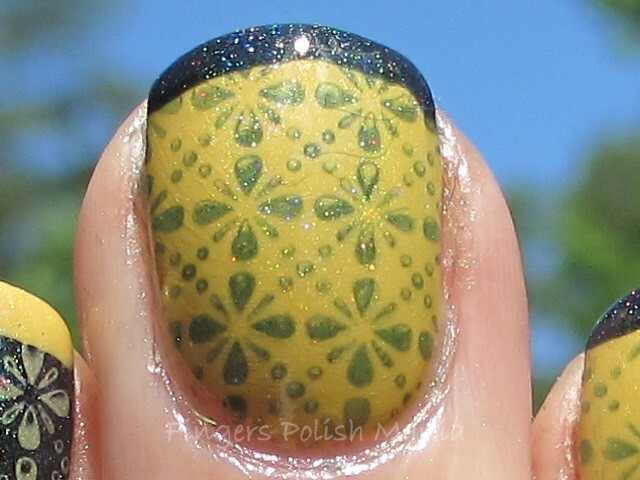 This Yellow holo is very subtle. I think it could have used more spectraflair. But it is a stunning banana yellow. Lizard Belly is a deep dark greenish black holo and I just love it. 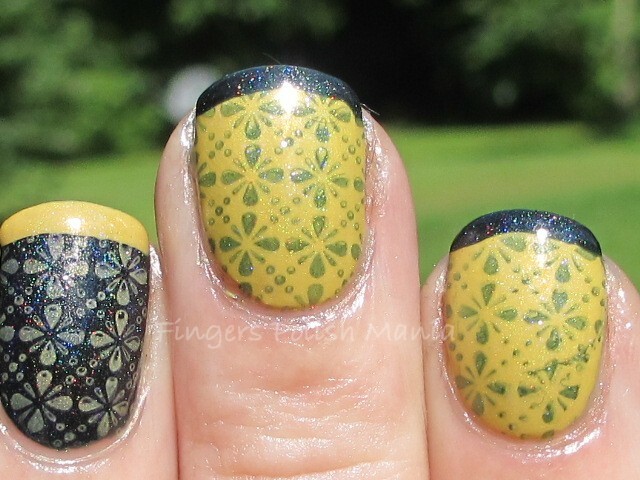 I then stamped with the opposite color, plate DRK-A and topped it off with my funky. Nothing too fancy today. Here are your results. Oh I am loving the accent nail on this one! The bling of the holo is simply amazing. On the Yellow, the LB looks like little jewels. It is stunning. Simply stunning. What do you think? Got any thoughts about the above discussion? Lemon Lime with a Twist.